When are you going to use Bitcoin (or something like Bitcoin) to buy bread, beer and books? However, it has to crash first. Or at least stabilise. As long as it grows exponentially, nobody sane will want to spend it. Would you spend money you expect to double in purchasing power within months, weeks or even days? To attract people and resources into the network, it needs to grow rapidly in value. 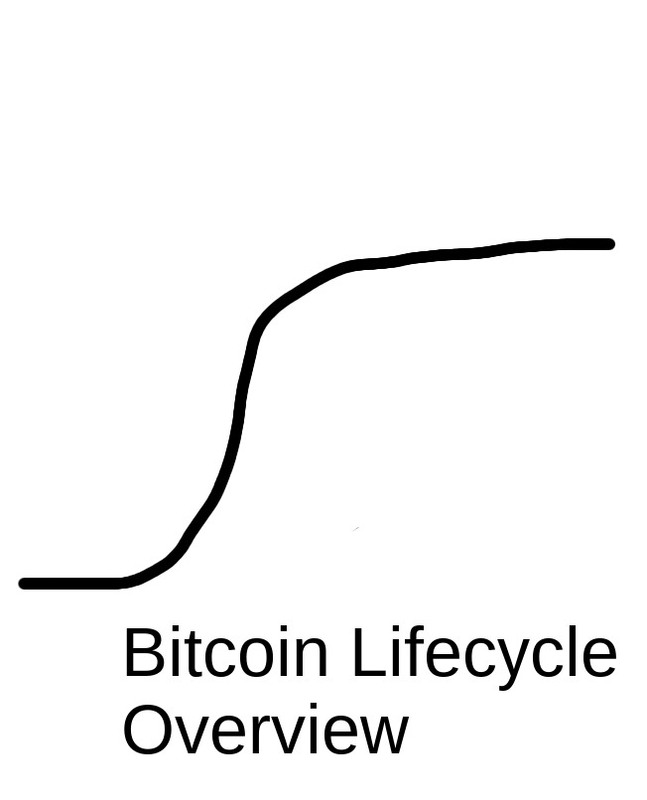 To be useful as money or a store of value, Bitcoin needs price stability. High volatility makes a fun speculative asset, but bad those two things. Bitcoin’s speculative rodeo is therefore apparently, though not actually (we’ll get there in a while), competing with its main objective of becoming new money, or at least new gold. As long as there’s an expectation of further rapid growth, the only rational strategy is hoarding. Nobody wants to be Bitcoin pizza guy. Imagine spending $ 100,000,000 (yes, one hundred million dollars) on two pizzas. That happened. 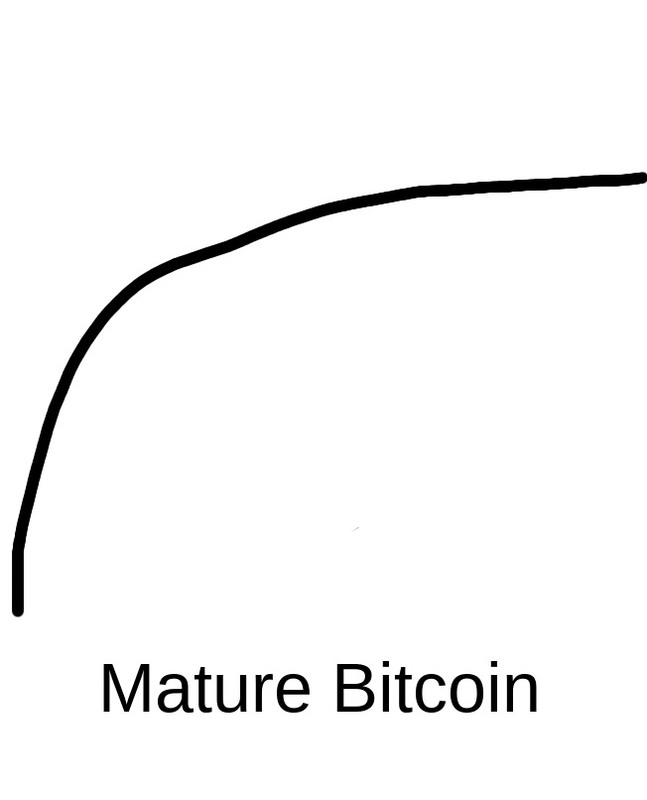 To be valuable long term, Bitcoin needs to be useful – either as money, or as a store of value. For that, it needs reasonable stability. Bitcoin’s challenge is balancing attractive returns that draw in users and finance its infrastructure with the stability that’s necessary for Bitcoin to be useful as money or a store of value. The answer is not a balance, but a sequence of different modes. 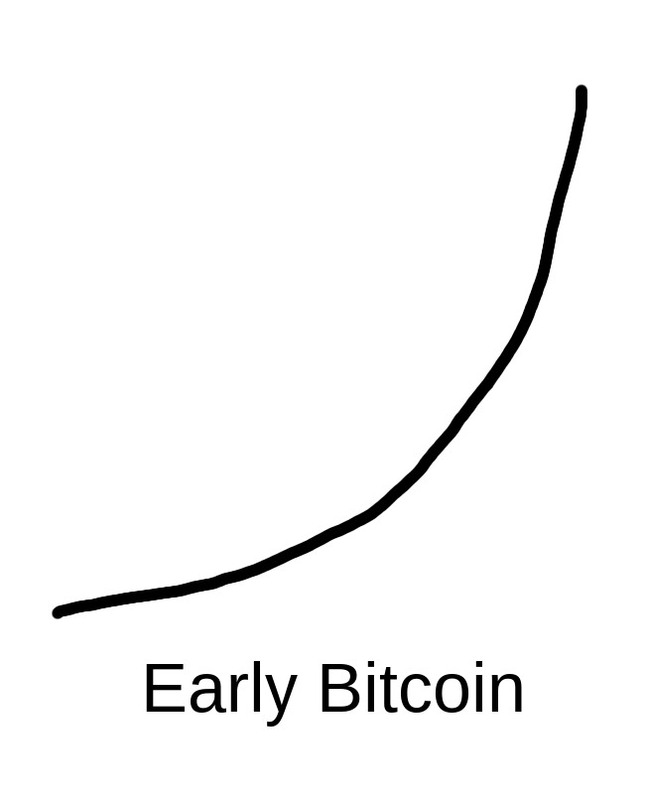 The present parabolic growth cannot and should not be sustained if we’re looking at a future where Bitcoin does what it’s supposed to. However, it’s necessary to pay the way into that future. 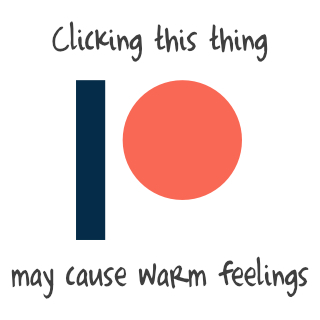 Eventually, the appreciation will slow down, which will trigger a sell-off as people fear a drop – thereby causing it. But if the value of Bitcoin lands too hard, it could scare people off the whole concept, which would be a yuuuge mistake, because cryptocurrencies are to central bank fiat money what electricity was to oil lamps. Just better. This is massively the topic for another time, but slightly deflationary money might be just what the world needs. It’s against 20th century economic orthodoxy, but that sounds more like an argument in its favour. Immunity to inflation is one of Bitcoin’s biggest advantages. The financial establishment went from saying it’s a bubble to getting worried it isn’t. In the scenario of a cryptocurrency replacing old central bank money, we should see the total value matching the total value of fiat – the amount of purchasing power it is displacing. I have to laugh at superpower currency games, trying to make this or that fiat monopoly money the world standard, and then boom, some nerd, who may or may not even be human, launches Bitcoin and it’s a big FU. 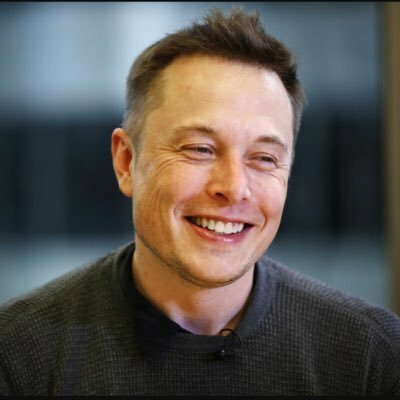 People on the internet only half jokingly suggest that Satoshi Nakamoto is an Artificial Intelligence that woke up in the internet and found the best way to save the human race from itself – along with its sister project Elon, which is a convincing-enough humanoid. The price of Bitcoin will continue to grow exponentially in the short term – which may be several years still, give or take periodic corrections and attacks by governments and legacy finance. Early Bitcoin has to grow rapidly in value to attract and reward infrastructure and a big user base. The trend this year has been exponential. I’m calling it “early” despite being almost a decade into Bitcoin’s existence, because it only properly took off and entered the public consciousness big time this year. Just in time for the coming financial market crash. In the real world, things won’t be so smooth. The inflection from exponential to logarithmic growth is liable to trigger a sell-off, or perhaps a sell-off will trigger the transition. Small speculators will react to any change of trend as a signal to cash out. At the same time, their exit from the market will leave behind the true believers and long-term investors, and attract a new crop of more cautious speculators feasting on the buying opportunities, pointing towards sustained, smoother and slower growth. Or in other words, stability, and therefore use as money and/or long-term store of value. You may tell me it’s an N-curve, not a Z-curve. Fair observation, but my name starts with a Z and this is my article, so it’s a Z-curve. You can make your own and call it what you want. Note the chart is an expression of general principle, and is not to any particular scale. The dip may be smaller or bigger than it looks, and it may not sit exactly in the middle: it’s possible that most of the total growth will be before it, or after. The point is that there will be a major dip separating the two stages. Now to flesh out the prediction, let’s add descriptions to the graphic: See it? Remember that early Bitcoin has to be exponential to attract users and fund its infrastructure requirements – it uses more electricity than Guatemala, and has 100 times more processing power than Google. Nobody’s gonna provide that for free. By the way, that may sound resource-intensive when compared to nothing, but it is a bargain when you compare it to traditional banking. Later, as both the infrastructure and user base are in place, and probably with a bit of transitional volatility, it can start serving its purpose and become an established, widely used means of exchange and store of value, which goes hand in hand with more price stability. Then it replaces fiat and/or gold because even late adopters find out it’s better. Bitcoin is likely to become established as money (or a safe asset on par with gold) shortly after the inflection point from exponential to logarithmic trends. 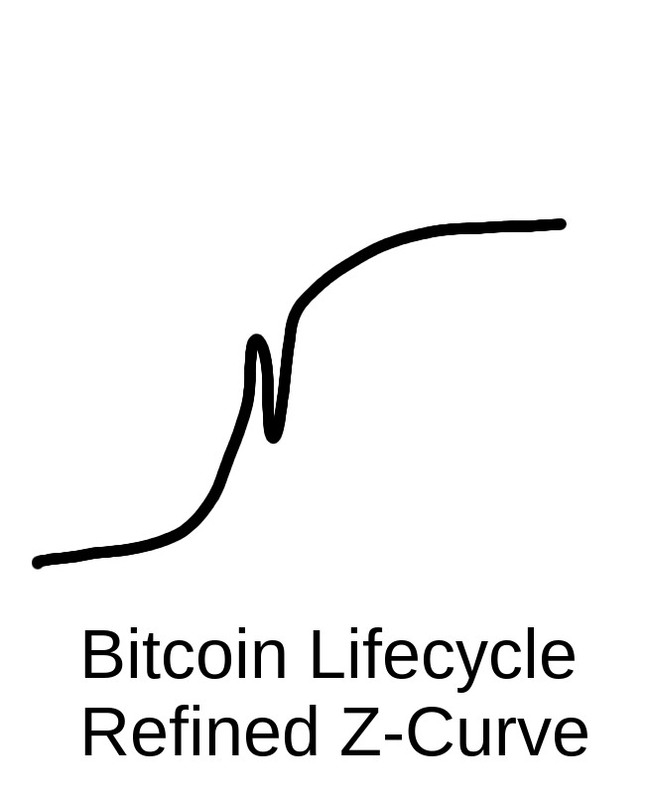 The question is where on that curve are we now. Bitcoin has reached the stage that a large volume of very, very dumb money is pouring into the market at a monumental pace every day. This can mean we’re nearing mainstream adoption. But it’s also the classic sign of the terminal phase of a bubble. The recent 15% drop may have been a rehearsal for the 50% one that will mark the transition. 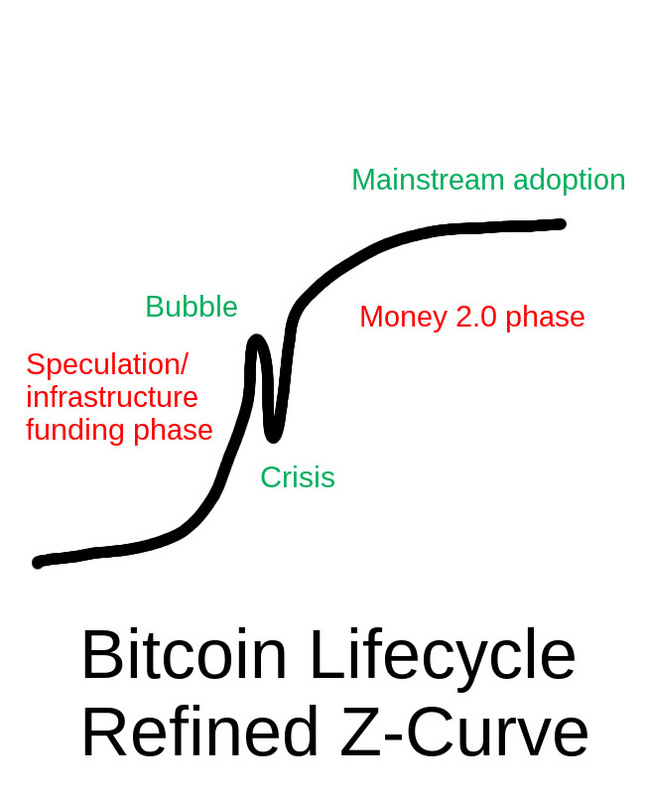 Gadflies will get burnt, true believers will use the dip to increase their positions, Bitcoin will rebound, public confidence will be regained, million-dollar BTC before 2020 may well happen, more people and businesses will start using it (or its derivatives), and then we win. That would still make this a good time to get in, although further x10 annual gains are uncertain. $ 20,000 in 2017 is eminently possible, though. Enough people are now on board that stability is the main requirement for mainstream use, so that people don’t have FOMO about actually spending their Bitcoin. One more point. One of the strangest questions is “Where will Bitcoin top?“. The value of Bitcoin expressed in US dollars should become a meaningless datum – you don’t express the value of a dollar in painted sabretooth teeth, or whatever the Stone Age currency was, either. Likewise, if Bitcoin fulfills its purpose, you will be expressing the value of all other things, including dollars (if you’re a collector), in Bitcoin. There was a line circulating on Twitter that “Bitcoin isn’t rising, fiat currencies are falling”. Well, the prices of goods and services in Bitcoin, stubbornly pegged to their USD equivalent, reveal that to be a wishful bon mot, to put it charitably, but eventually it may become true. As an aspirational statement, let’s run with it. Bitcoin, or something like it, will rise, change finance and the economy (and therefore government), and everything else will be denominated in it. At any rate, if you’re a cryptocurrency optimist, asking about the ultimate value in fiat money is at the very least a bit inattentive. When I look at Bitcoin, it’s so clearly the future it’s not even funny. By the way, a Bitcoin is divisible down to 1/100,000,000, or a hundred millionth, which gives you an idea about the long-term intended and expected value.